Place your order online, call our toll free number, fax or mail your order. All internet orders received by ARBICO Organics will be confirmed via e-mail. Our order department is open Monday through Friday from 8:00AM until 5:00PM Mountain Standard Time. We pride ourselves on providing you superior customer service. Please feel free to call us with any questions or comments you may have. The Following Credit Cards & PayPal Are accepted: American Express, VISA, Master Card, Discover and PayPal. PayPal orders can only be placed online. If for any reason the information you provide for credit card payment is incorrect, we will contact you. If we are unable to reach you within 72 hours, the order may be cancelled. When sending a check or money order contact us for a shipping quote. Please make checks and money orders payable to ARBICO Organics. Please include a list of the products you wish to order, your shipping and billing address, contact information and telephone number. For checks, also include your driver's license number and date of birth. International orders require an electronic bank transfer of funds. Please contact ARBICO Organics for bank routing information. Your order will be processed once the wire transfer has been completed. Credit Card Decline: If an instance arises where the credit card we have on file does not go through, we will contact you via email regarding the issue. After that, we will contact you at the telephone number on record three times. If we do not receive new payment information after three contact attempts, we reserve the right to cancel the existing order(s). We accept Purchase Orders from schools, most businesses, organizations and government agencies upon approval. Our minimum order for purchase orders is $300.00. Please use a credit card for orders under this amount. Please use the following information to contact our Accounting Department for a credit application and to submit a Purchase Order: territowne@arbico.com or call us at 1-800-827-2847. Shipping charges will be calculated automatically during the checkout process. Some products ship via one method while other products may have several options. You will see the shipping total before you complete your purchase. Additional charges may apply when shipping to Alaska and Hawaii and we will contact you before processing your order. Shipping Couriers Available: USPS (US Mail), UPS and FedEx. Freight options available upon request. Is the delivery address residential or commercial? Is the delivery address a rural address? Is there a scheduled delivery time required? Is a gate code necessary to ensure delivery? Is a lift gate required upon delivery? If proper delivery details are not disclosed at time of order placement and new charges are incurred, the customer is solely responsible for the costs. Additional charges will be processed using payment information provided. Please check your order to make sure that the order is complete and undamaged before signing the bill of lading for all freight deliveries. ARBICO Organics will not accept responsibility for lost or damaged goods unless you have made a note on the bill of lading at the time of delivery. Shipping Included Items: Some products we sell have shipping included. Shipping is included for the lower 48 U.S. states only. Additional charges will apply to ship these items to Alaska and Hawaii. Order Processing: Please allow 1-2 days to process your order. While every effort is made to expedite Next Day and 2nd Day shipments, we cannot guarantee same day order processing. Many live products that require Next Day shipping cannot be shipped same day due to lead times for collection or processing. Tracking information for all deliveries are automatically sent when an email address is provided. 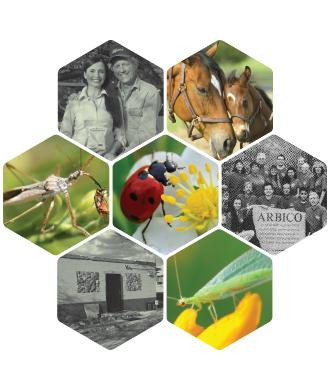 Live Shipments: ARBICO Organics guarantees that live product orders will be alive upon arrival. However, to ensure live delivery, it is important that you receive your order when it arrives. If you would like detailed tracking information, please call or email us and we will provide that as soon as possible. We will NOT be responsible for live shipments left unattended at your doorstep or address of delivery. Please make contingent arrangements to have them picked up by a neighbor or delivered to a work address if you will not be home during the day. LIVE BENEFICIAL INSECT ORDERS MAY REQUIRE ADDITIONAL TIME TO FULFILL. Please note that orders may arrive in 2 or more shipments. Items with shipping included may have specific shipping methods required. Shipping upgrades are available for those items, but will incur additional charges. • No live shipments to Hawaii. • Aerosol products cannot be shipped to Hawaii, Alaska or international addresses that require air transport. Aerosol products ship via ground methods only. International shipping is available. Please call for ordering, shipping quote and possible product restrictions. International orders cannot be placed on our website. Please call to place an order. When shipping your order outside the US and US territories, you may be subject to import taxes which are levied when your package reaches its destination. Additional charges that may apply for customs clearance must be paid by the customer. We have no control over these tariffs, and therefore cannot predict what they may be. Please contact your local customs office for further inquiries. Moreover, when ordering from ARBICO Organics, you are considered the importer of record and consequently, you must comply with all laws and regulations of the country in which you are receiving the goods. Your privacy is important to us. We would like our international customers to be aware that over-the-border shipments are subject to opening and inspection by customs authorities. In addition, we may be required to supply certain order, shipment and product information to international carriers. This information will be communicated to customs authorities in order to facilitate customs clearance and to comply with local laws. Customs authorities require us to state the value of your order on all customs forms. Import permits may be required for products, please verify the documentation necessary before placing your order. Obtaining pertinent import permits is the responsibility of the purchaser. If an item is out of stock or back ordered, we will notify you via email, telephone or backorder slip. It is extremely important to check your order upon receipt. Please notify us IMMEDIATELY if there is a shortage, damage or any other discrepancy with your order. All returns must have an RMA number (Return Merchandise Authorization). Please call our Customer Care department to obtain this number. Merchandise must be returned within 30 days for a refund on the cost of the product only. We refund only for merchandise that is in re-saleable condition and in its original packaging. Shipping will not be refunded. Returned merchandise that is not re-saleable will be charged a 20% restocking fee. Please indicate the reason for your return on a copy of the enclosed invoice. Shipping charges are non-refundable. Products are returned at customer's expense. There are no returns on live product. We guarantee live insects upon delivery. If there is any damage to products or viability issues with live product, please call us within 24 hours to report the issue. To cancel any scheduled future shipments, we require a notice of 7 business days prior to shipment going out. IMPORTANT: For freight deliveries, please check your order to make sure that the order is complete and undamaged before signing the bill of lading. ARBICO Organics will not accept responsibility for lost or damaged goods unless you have made a note on the bill of lading at the time of delivery. If you have received a defective product please call our Customer Care department to arrange for a replacement. We guarantee live insects upon delivery and require notification of problems within 24 hours of delivery. Applicable sales tax will be added to items delivered to an Arizona address. Our goal is for you to be as comfortable shopping with us as you are shopping with a local supplier. We take the issue of security very seriously. Every time you send us your credit card number and your billing and shipping information, we use the industry-standard Secure Sockets Layer (SSL) technology to prevent the information from being intercepted. Together with the electronic commerce community, we have taken every measure to ensure that your online shopping is as safe as ordering from a catalog or making a purchase from a retail outlet. Thank You From The ARBICO Staff - We look forward to providing you with excellent customer service and all your organic growing needs.